This Adjustable Campbell Mutual Inductometer is splendidly housed in a solid mahogany box with a one-piece timber lid. The top contains seven brass terminals, two rotary range switches and a semi-circular scale. "Total 10 000 microhenries" is stamped in the middle of the scale. Inside are mounted two fixed primary coils and two fixed and one moving secondary coil. A mutual inductometer measures the inductance between two inductors - that is, it measures the strength of the electromotive force (emf) produced in one inductor as the result of the current changing in the other inductor. 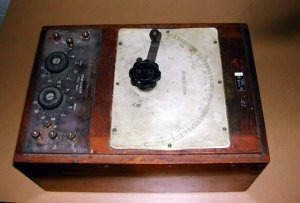 The Campbell Mutual Inductometer is unique in its design in that the scale on which the user reads the inductance does not have a linear progression of values. Instead, the lower values are more spread out, allowing them to be read with much greater accuracy. This extends the useful working range of the device. This effect is achieved by mounting the primary and secondary coils such that one is kept fixed and the other can be rotated about an axis with the mean plane of one always parallel to that of the other. This particular inductometer is a long range type, which incorporates strands of wire on both the primary and secondary coils connected in series to enable inductances to be added or subtracted by connecting particular strands. In this way the user can either step up to multiples, or step down to submultiples of the inductance and obtain an accuracy of subdivision in the lower part within 1 part in 10,000 and in the higher part up to 1 part in 100,000. 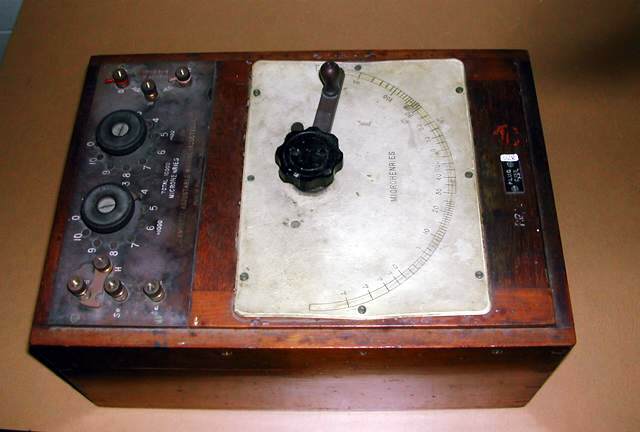 The inductometer was made by Robert William Paul, a British electrical engineer. Paul was educated in Finsbury at the City & Guilds Technical College. He worked in the electrical instruments shop of Elliot Brothers where he learned about manufacturing electrical instruments. In 1891 he began his own business and focused on producing high quality instruments to meet the demands of the expanding electrical industry. As well as being a talented and successful instrument manufacturer, Paul was also a pioneer in the film industry. The Whipple Museum of the History of Science Catalogue 8 - Electrical and Magnetic Instruments.